Grows, shrinks, or adds noise to the edges of a Matte input, and outputs the resulting matte. In the Sapphire Composite category. Source: The current track. The input clip containing the matte to process. The matte is assumed to have anti-aliased but hard edges, because very soft edges might not be affected in a useful way. Shrink- Grow+: Default: 0, Range: any. Amount to grow the matte edges in approximate pixels, or shrink if negative. Edge Softness: Default: 1, Range: 0.01 or greater. The resulting softness of the edges. Post Blur: Default: 0, Range: 0 or greater. If positive, the result is blurred by this amount. This is an alternative method for softening the edges. Filter: Popup menu, Default: Triangle . The type of blur filter to use for the shrink or grow process. Box: uses a rectangular shaped filter. Triangle: smoother, uses a pyramid shaped filter. Gauss: smoothest, uses a gaussian shaped filter. Matte Use: Popup menu, Default: Alpha . If enabled, the black and white of the output matte are inverted. Output: Popup menu, Default: Matte . Selects the format of the output. 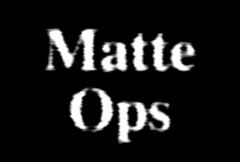 Matte: the processed Matte is output on all channels. RGBA: the Alpha output channel receives the processed Matte, and the RGB channels are passed through from the input unchanged. RGBA Premult: the Alpha output channel receives the processed Matte, and the RGB channels receive the input multiplied by the new Matte. This option can be appropriate if you are shrinking a matte and need an RGBA result for pre-multiplied compositing. Noise Amplitude: Default: 0, Range: 0 or greater. The amount of noise texture to add to the edges. Noise Width: Default: 0.05, Range: 0 or greater. Frequency: Default: 100, Range: 0.1 or greater. The frequency of the noise. Increase for finer grain noise, decrease for coarser noise. This has no effect unless Noise Amplitude is positive. The relative horizontal frequency of the noise. Increase to stretch the noise vertically, decrease to stretch it horizontally. This has no effect unless Noise Amplitude is positive. Octaves: Integer, Default: 1, Range: 1 to 10. The number of summed layers of noise. Each octave is twice the frequency and half the magnitude of the previous. This has no effect unless Noise Amplitude is positive. The horizontal and vertical translation of the noise texture.